The City of Tagbilaran prides itself of being a city of friendship. This claim is based on the historic blood compact between Rajah Sikatuna and the Miguel Lopez de Legaspi. The agreement between the Spanish conquistador and a native chieftain has been described as one of the first, if not the first, treaty between the east and the west. This tradition of hospitality and friendship continues as the city gives warm welcome to visitors and tourists especially through its port. We got to observe this hospitality when the ship we were taking to Dipolog City made a stop at the Port of Tagbilaran on - what better day - Good Friday. One would think that, considering that it was Good Friday, there would be little activity at the port. Wrong. The first to greet us was the the pilot boat which met our ship to "deliver" a pilot who will assist in steering and docking. The boat's approach provided brief entertainment to us passengers who have been watching the sea for around a day already. As the ship was about to dock, we were met by small boats carrying women and children - boat people, we used to call them - all waving at us and begging us to throw coins into the water. With ease, they dove after and retrieved the coins, emerging from the water with warm smiles on their faces. It was fun watching them, although it was also disturbing to see infants on the boat with them. During the stop, we made sure to go around the port and buy some goodies. 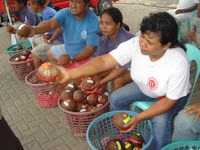 Vendors of the famous calamay were all lined up under a tent, all reaching out to you with the all too familiar coconut shell with a red band. Beyond them were stores and carinderias selling, among others, the famous peanut kisses and its variants, very cheap barbecue, the diamond shaped "posu", and the traditional probinsyano pasalubong of cookies in large square cans. After shopping, we also took time to appreciate the beauty of the port. One would easily notice the blue green waters, the bancas docked there, and the many tricycles - with the always present bible verse at the back - waiting and ready to take passengers into the heart of Tagbilaran, the city of friendship. In case you haven't noticed, this is really a case of a Boholano trying to be a tourist in his own province. On a Good Friday at that.